Q: So here we are, back after weeks of travelling around by boat and by car and what have we learned? A: Well, yes, that's it. I am overwhelmed by the vineyards. I cannot believe there is so much demand for wine, not even in France. We might as well be washing our shirts in wine or rust-proofing our bicycles with it, so much of this part of the planet appears to be dedicated to its production. So then the question becomes, how do these vineyards make money, given that there are so many thousands and thousands of them? This has been bugging me for a while. Down in the south-east, Ventoux, region, many of the vineyards are made up of quite small parcels of land, adorably set among rolling hills and steep mountain ranges, interspersed with orchards and olive groves, the vines often playfully untidy, the earth between them sometimes bare and conscientiously tilled, sometimes grassed over, sometimes completely covered in weeds. It's outrageously pictuesque, but does it pay? It looks so inefficient. Especially when contrasted with the places on offer in the other bit of France we quartered, including (if I remember right) Lussac-St Emilion and Puisseguin-St Emilion, not that we actually drank any of these, but anyway. Unlike the Ventoux plots, these are huge, incredibly orderly, hectare after hectare of vines razored into perfect conformity, no stragglers, no odds and ends, no weeds, just regimented plants of uniform height and character marching into the distance, where, presumably, an equally rectilinear château sits counting the proceeds. It's the difference between Beijing and Bath. 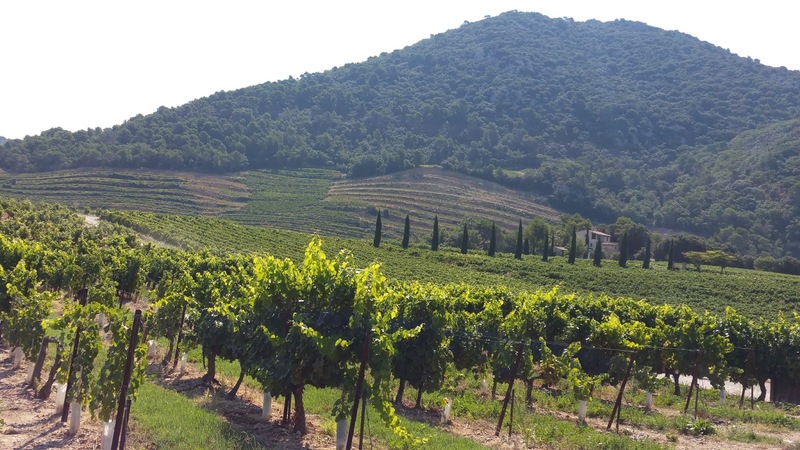 All right, Ventoux is a smallish name in French wines, Bordeaux is an industry, but Ventoux growers like to make a profit as much as anyone else. To put it another way: how big does a vineyard have to be, in order to survive? Evidently a huge amount depends on exactly where you are, how highly-prized your region is, how mature the vines are, what subsidies are available, how easy it is to strip-mine the terrain of its grapes using modern equipment, how easy it is to hire people at key times of the year and so on. And this is before you even get to the terrifying imponderables of weather, disease, infestation, fashionability. I know this. But on the other hand, it doesn't stop me Googling How big does a vineyard need to be? Turns out this is a question asked at least once every day, sometimes more. There are scores of answers, many of them aimed with full finger-wagging severity at well-heeled semi-retirees who fancy their chances at winemaking while utterly overlooking the downside. 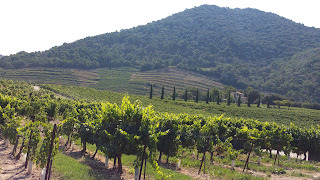 A rough count suggests that a decent-sized holding in France or Italy is about 8 hectares, going down to 4 if the vines are good and you can get along on a smallish profit. The average holding in France is 10.5 hectares; the average price of land (excluding the Champagne region, which is so far off the scale it distorts the results) is about €60,000, but you can get something sensible in a non-chic part of the country for €12,000 or less. Clearly, you can make money out of a single French hectare if it's fair quality and productive; whether you simply harvest the biggest possible tonnage of raw grapes and send them to the local co-operative or press and bottle the product yourself is another issue. Elsewhere, the economies of production are such that whatever the size of the holding, you might very well cut off all the grape clusters except for one, perfect, cluster per vine, devote the whole season to bringing on that bunch of grapes and then turn it into a fabulously high-end wine whose scarcity you have gone miles out of your way to secure. Our pals with their little piece of heaven in the Ventoux have established a tiny vineyard of about half a hectare and I have no idea which way they plan to go; nor, indeed, have they, given the youthfulness of the vines and the bother of harvesting. Equally, I could plant a vineyard in our back garden, do all the work by hand and possibly make a couple of quid, if it wasn't in London, north-facing and there wasn't a huge tree right in the middle of the plot. Still. It's something to think about, now that autumn's approaching. And I might even get an EU grant!